Known for their high-quality skincare products, Baxter of California looks to revive one of their old icons with a return to the fragrance market as they look to unveil a new series of cologne, 35 years after their inaugural drop. The small fragrance line is marked by Bravado 2 and Bravado 3, a continuation of their mid-seventies original, the Bravado. Bravado 2 features edgy hits of citrus and musky accord while Bravado 3 is a little more subtle with a softer, cleaner scent. The packaging comes courtesy of Marc Atlan and includes a foil-based ink-splattered motif. 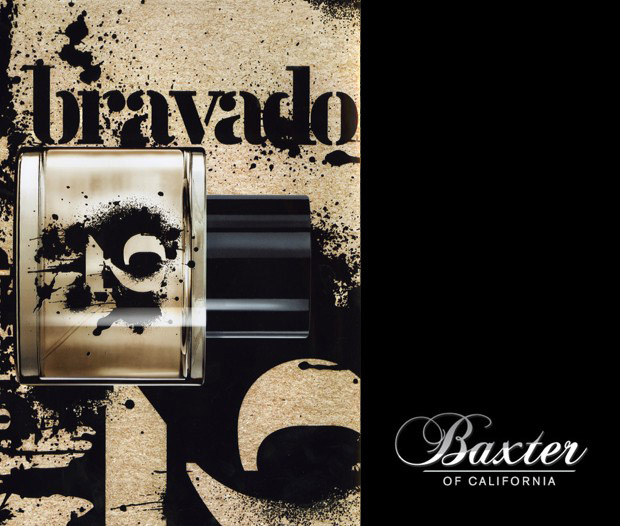 Baxter will officially launch the Bravado collection with an exclusive Barneys partnership across the US in April and eventually see a more wide-spread release at Baxter’s current candle retailers as well. The 100 ml bottle for both scents is priced at $80 USD.